The EFM brand is a built around journeys of discovery and ‘All the Places You Go’. Their range of Bluetooth Speakers are a premium audio solution delivering a high-quality audio experience. Designed as a robust outdoor companion, the speaker’s durable qualities, immersive sound and water resistant features are built to withstand the rough and tumble extremes of outdoor living. Cardboard tubular packaging is both a lightweight and a protective solution to pack, display and ship the cylindrical speakers. 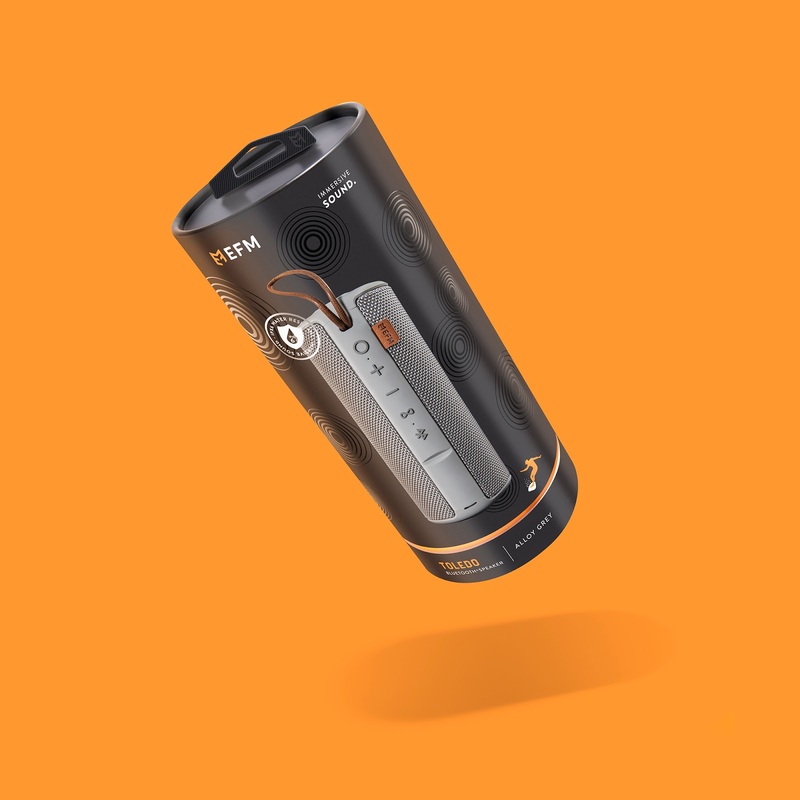 The two-part packaging features a hanging top which slides over a shorter, inner printed with a fluorescent orange and charcoal rim base. Once the speaker is placed within the inner tube, it acts as a preventive buffer stopping the top tube from fully reaching the inner base tube. This shortfall allows a ring of the brand’s fluorescent orange to feature as part of the overall packaging design. The design itself, while minimal, embraces the EFM brand values. Product naming conventions relate to ‘All the Places You Go’ and align to real places and experiences – in this instance, Toledo referencing the musical association to Elvis Presley and his place of birth. The design features concentric circles of different sizes bouncing around the image of the speaker. 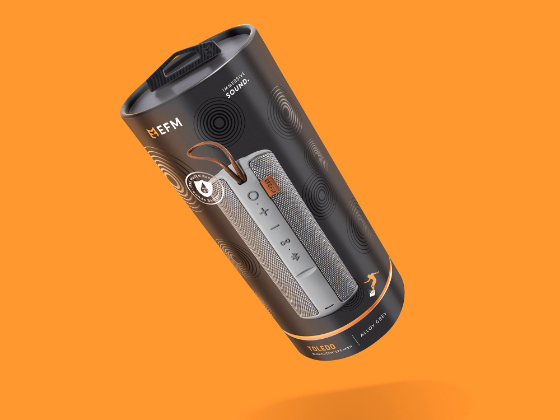 Printed in a gloss UV they form a pattern mimicing sound waves as a big, booming bass – a key feature of the speaker and as ripples water demonstrating the product’s water resistant capabilites. The quality of the brand and its resistance to extremes is further highlighted on the front of the packaging within a silver foil seal. Available in two sizes and a range of colours the newly released range of speakers sold out at the time of launch and continues to meet sales targets.